Medicare is stronger than ever with more benefits, better choices, and lower costs to beneficiaries. Expanded Medicare benefits under the Affordable Care Act continue to be available, including certain free preventive benefits, cancer screenings and an annual wellness visit. Whether you choose Original Medicare or a Medicare Advantage plan – take advantage of Open Enrollment to review cost, coverage, or both for next year (2014). More Benefits: Certain preventive benefits – including cancer screenings – are available with no cost to patients when furnished by qualified and participating health professionals. The annual wellness visit allows people to sit down and discuss with their doctor their health care needs and the best ways to stay healthy. Better Choices: Medicare will notify beneficiaries about plan performance and use its online Plan Finder to encourage enrollment in quality plans. Lower Costs: Average premiums for 2014 for prescription drug coverage and Medicare health plans will remain stable. People who are in the “donut hole” in Medicare’s prescription drug benefit will enjoy approximately 53% discounts on covered brand name drugs and see increased savings on generic drugs. The new Health Insurance Marketplace won’t affect your Medicare coverage and is not part of Medicare Open Enrollment. Medicare is not part of the Health Insurance Marketplace. You do not need to enroll in the new Health Insurance Marketplace to maintain or change your Medicare coverage. Your health needs change from year to year. And, your health plan may change the benefits and costs each year too. That’s why it’s important to evaluate your Medicare choices regularly. 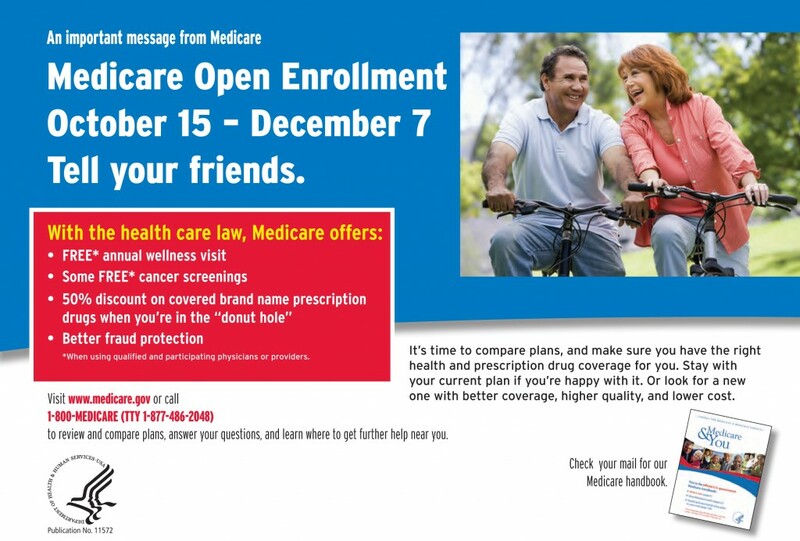 Open Enrollment is the one time of year when ALL people with Medicare can see what new benefits Medicare has to offer and make changes to their coverage. Visit www.medicare.gov/find-a-plan to compare your current coverage with all of the options that are available in your area, and enroll in a new plan if you decide to make a change. Call 1-800-MEDICARE (1-800-633-4227) 24-hours a day/7 days a week to find out more about your coverage options. TTY users should call 1-877-486-2048.
Review the Medicare & You 2014 handbook. It is mailed to people with Medicare in September. If you have limited income and resources, you may be able to get Extra Help paying your prescription drug coverage costs. For more information, visit www.socialsecurity.gov/i1020 or call Social Security at 1-800-772-1213. TTY users should call 1-800-325-0778. Get one-on-one help from your State Health Insurance Assistance Program (SHIP). Visit www.medicare.gov/contacts or call 1-800-MEDICARE to get the phone number. Have you done your yearly Medicare plan review?